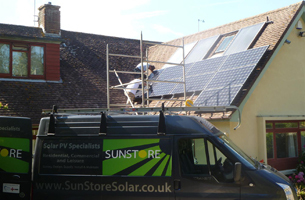 We supply and fit solar panels throughout Sussex, Surrey and Kent. 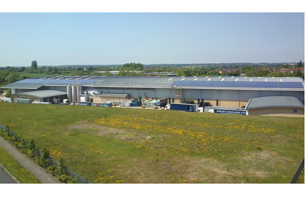 A 250kw installation at Natco Foods Ltd in Buckinghamshire. 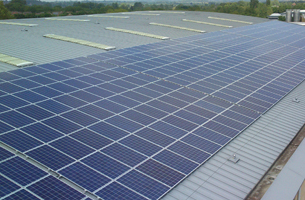 Using over 1020 245w Solar Modules from Trina Solar we installed 48 strings of up to 23 panels. Over 10km of DC cables for this huge roof to 8 x 30kw Power one Trio inverters concerting the power into a 350Amps suppy for the commercial building. We were very happy and loved achieving this mammoth task. 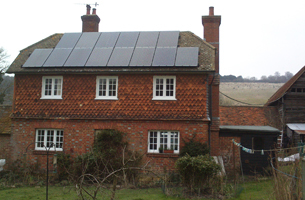 Utilising SMA Sunnyboy and Island technologies we were able to convert this off-grid cotttage into a usable residence. 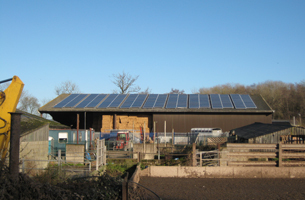 For over 8 months of the year this system is self sufficient with no costs. 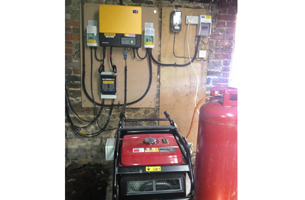 For the winter a small, regular amount of batter charging is required from the generator to sustain the 10kwh per day requirement. 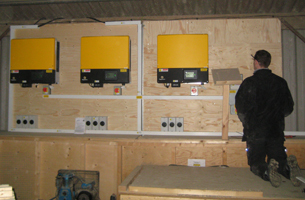 3 x SMA Sunnyboy 15000TL Inverters with 207 Suntech STP240w Modules. 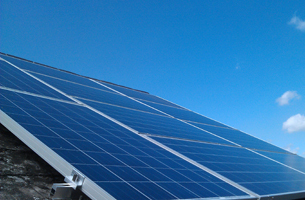 This system was estimated to generate 40MW per year but as of year 2 it has generated 20% greater topping 100MW. 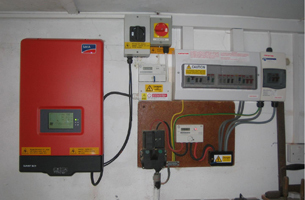 SMA Sunnyboy SB3000HF Inverter, Sanyo HiT N240SE10 Modules. South East @ -15 degrees from south. 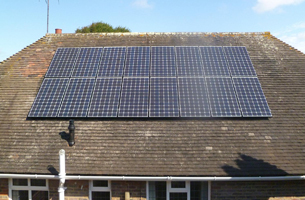 Just to let you know we generated 302 kWh in September (system installed on 1st Sept). That’s better than I was expecting from the database on the PV estimation utility (if you’re familiar with that). 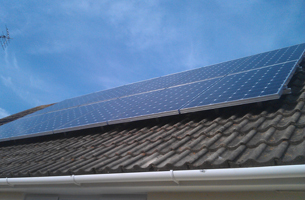 On the best days we just tipped 3kWh output, so again higher than we were expecting. We’re all enjoying looking at the inverter statistics as we go past and I have started to wait for the sun to come out before vaccuuming! 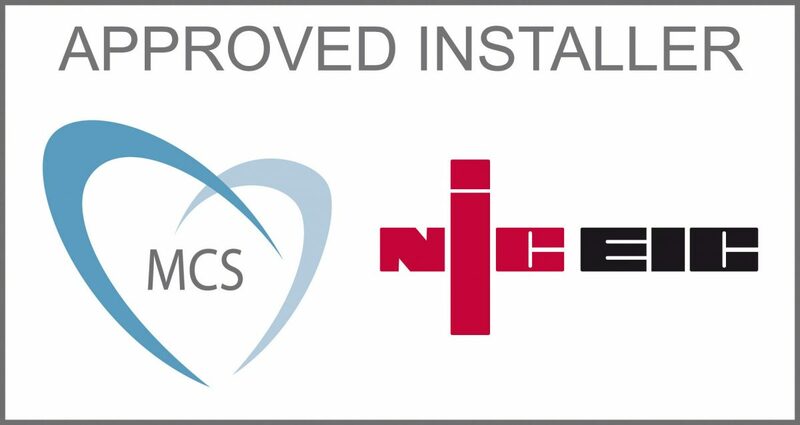 Many thanks for your friendly and efficient design and install service. 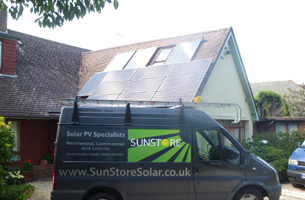 Would have no hesitation in recommending Sunstore to friends and family. 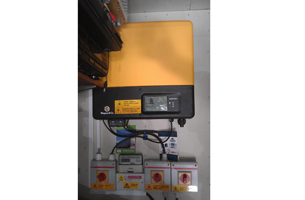 SMA Sunnyboy SB3000HF Inverter for reliability, efficency and yield. 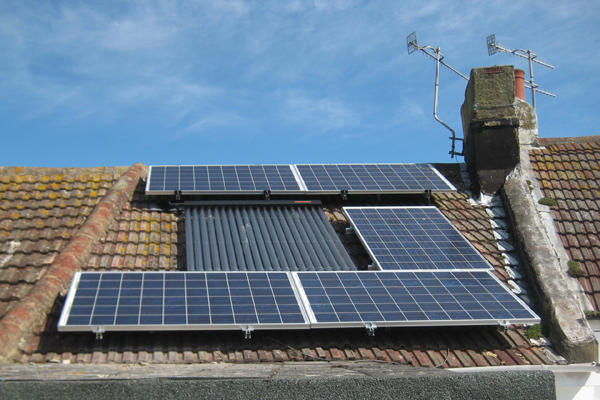 Power One PVI 3.0 Outdoor Inverter for 2 separate strings facing in different directions. This system athough may not immediately seem ideal but through a split tracker generates a very usable flat power curve from very early in the morning. This optimizes the potential savings. 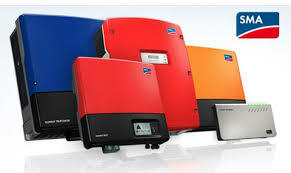 SMA Sunnyboy SB3000TL Inverter for the greatest reliability, efficency and yield. Transformerless technology means silent operation and no parts to wear out. The professional choice. 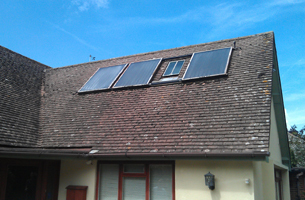 This system was producing over the 2.4kw on teh day we intalled it. 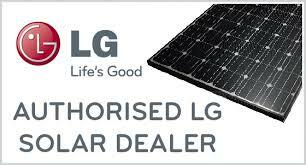 Sanyo offer their panels with a minimum power unlike competetors average. ie 240w means you get a 240 – 264w panel where as other manufacturers offer their 240w panels between 228 – 240+w if your lucky. SMA Sunnyboy SB4000TL Inverter for reliability and with 2 independent strings can achieve the best performance, efficency and yield. 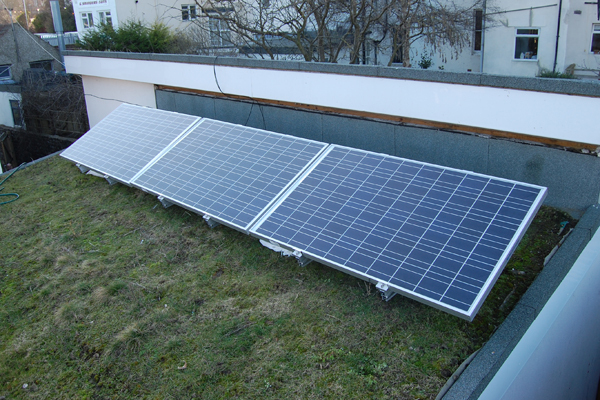 Sanyo H235SE01 Modules Enern on dark days this system generates over 7kw per day and with aglimps of the sun over 20 is not unusual. 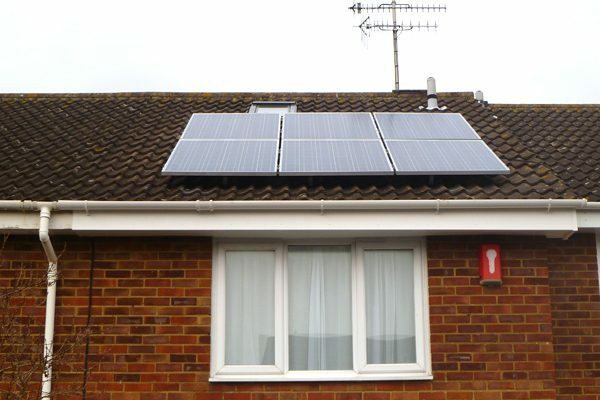 Distinctive Sanyo H series panel with the round cell.250 watts each on a south facing clear sky. 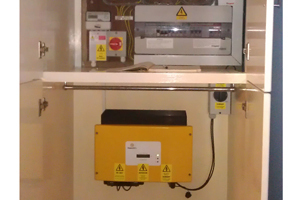 A complex install with design and intracate cable runs to connect the system. This system was very rewarding to work on. Concrete tiles and stainless steel fixings were included. 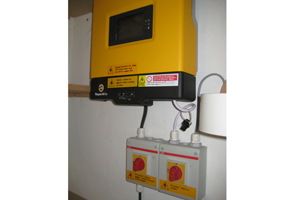 SMA Sunnyboy SB2000HF Inverter for reliability, efficency and yield. 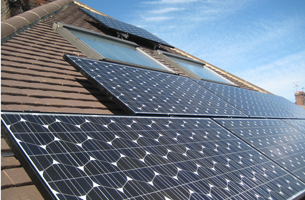 Polycrystalline Trina Solar 235 Modules to take best advantage of the East facing roof. Aesthetically very pleaseing with black framed panels. The Sanyo HIT utilise the superior Mono-crystalline cells and amorphous technologies these are rated at 21% efficient and regularly see a 25% greater yiearly yield. 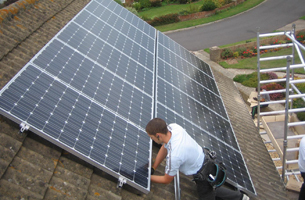 SMA Sunnyboy SB1200 inverter, REC 235 Polycrystalline Modules. 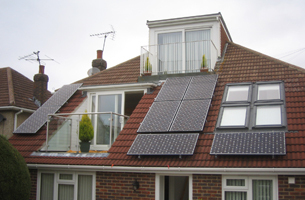 Mounted around the existing solar thermal system. REC 235 modules are compact and very sucessful generators. 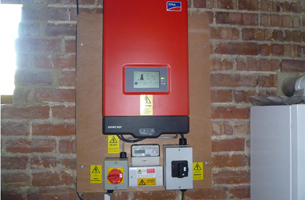 SMA Sunnyboy SB3000HF Inverter, 15 x Hyundia 203w Polycrystalline Modules. 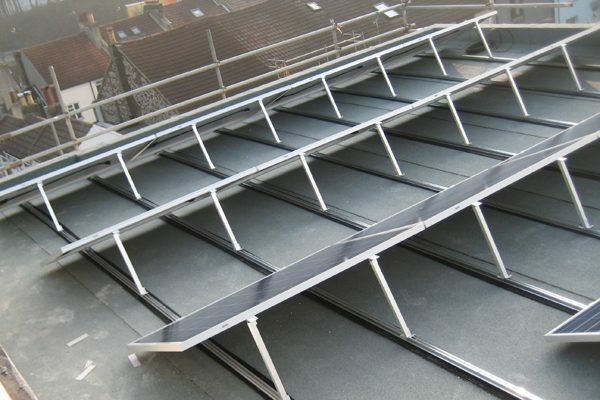 Mounted on a flat roof without any piercing of the structure to keep waterproof integrity. Hyundai modules are compact and very sucessful generators. 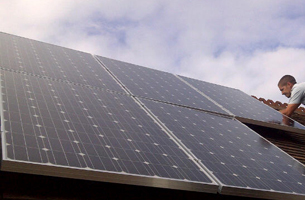 Mastervolt XS inverter, Schuco MPE 180 Polycrystalline Modules. 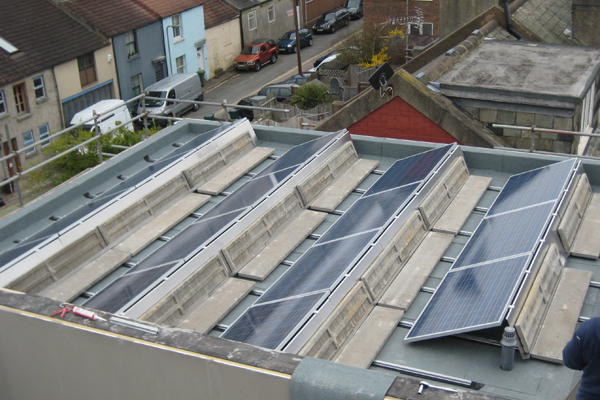 Flat roof mounts made with wood due to the new building restrictions in Brighton and Hove for this building. 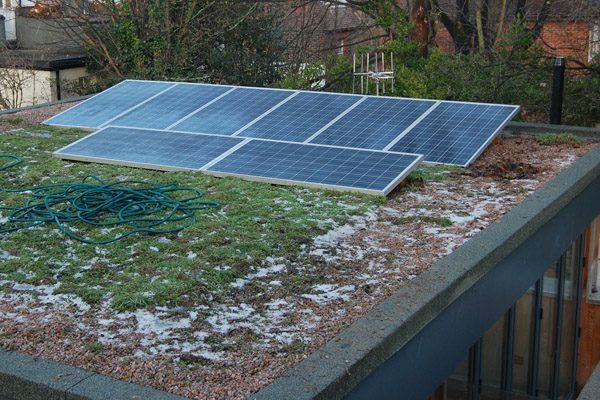 Making use of the flat area a green roof was used and the solar panels integrated considerately. 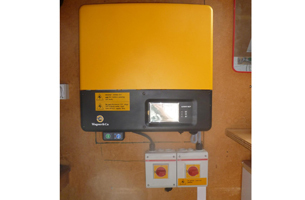 SMA Sunnyboy 1200 inverter, Hyundai 200 Polycrystalline Solar Panels. 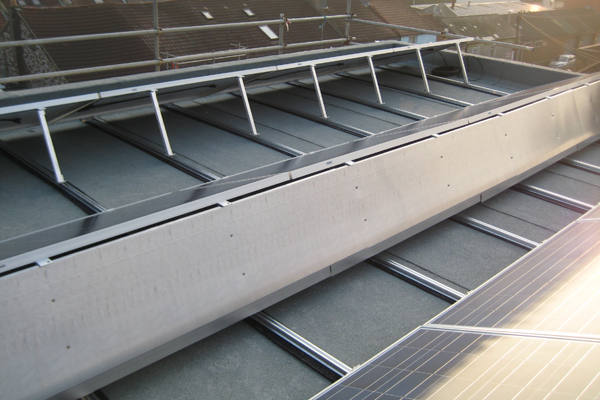 Using a very elegant mounting system we mounted the 6 Hyundai modules on the roof with no disturbance to the existing structure or tiles. 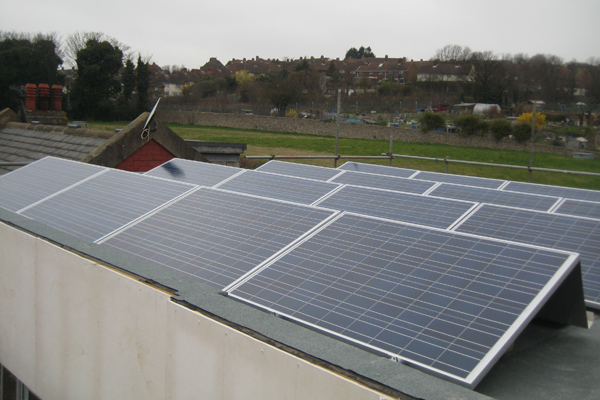 Polycrystalline panels are used in this installation as size was not an issue compared to budget. 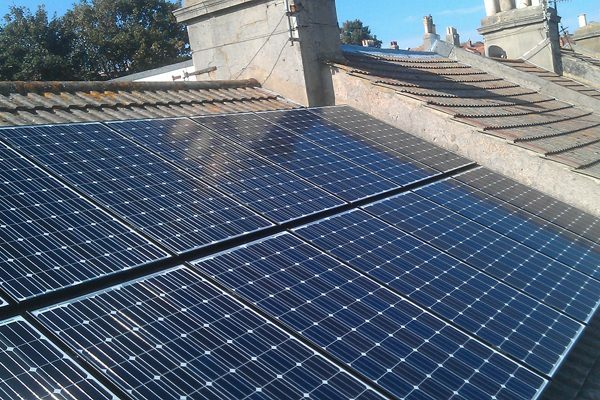 These panels are very consistent and generate good power in the duller cloudy days to offset against the electricity bill. 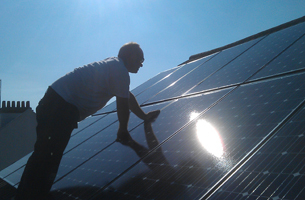 Mastervolt Soladin 600 inverter, 3 x Schott 235 Polycrystalline solar modules. 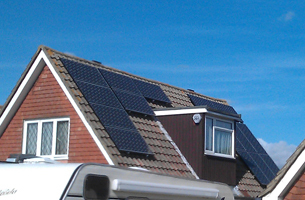 Due to shadows and roof design the best option for this smaller system was to face east at a low angle of 10 degrees. 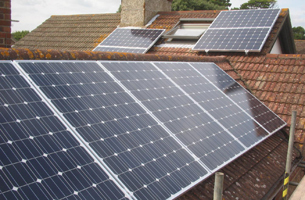 The high powered polycrystalline panels are better in indirect sunlight so the customer would experience the best gains from a limited situation. 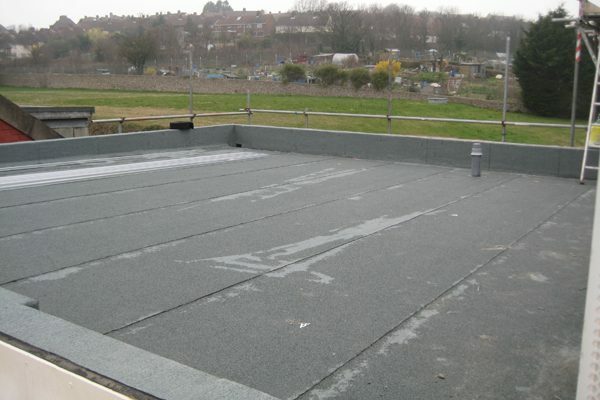 With flat roofs it is usually limited to ballast on the framework to ensure safety. 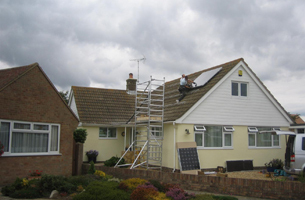 Drilling is not normally possible due to the roof skin and permiability issues. 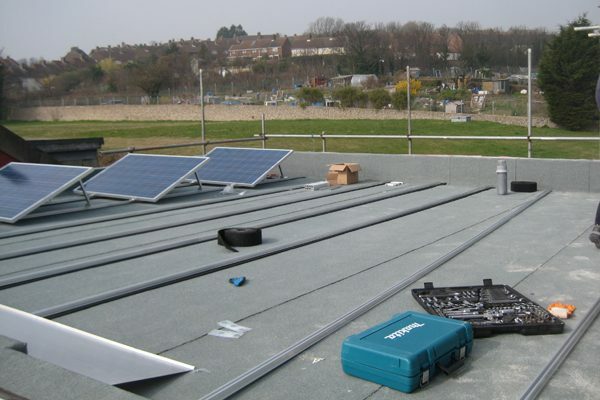 The balast is calculated and the correct amount of ballast is added.